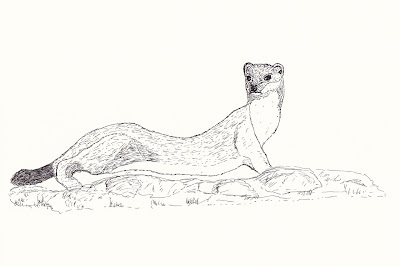 Very good likeness to the Stoat! I did a search, because it reminds me so much of the weasel, mink, and the Ferret...very much likeness with them!! Can be vicious little creature though!! Thanks GG, yes they certainly can be nasty little things. VERY nice, esp. like the rather haughty expression, lots of character! ...very cool! I like it! Rick just saw a river otter a few days ago. He looked a bit like your stoat (except he was in the water!). Surprisingly they are very tiny little things. I have enjoyed looking at your artwork this morning Roy. It reminds me of when I tried doing some of my own. Not very good at it but the act of putting a colored pencil to paper was very relaxing to me. Thanks Denise, its a nice past time and is what you make it really. I too much enjoy drawing and watercolour painting but not often enough to be very good at it. You have a delightful collection here Roy and I'll follow you progress with great interest. I really must try and do some more. I especially like the way you have captured that slinky, lithe, undulating motion in a still picture! You are getting quite good with your lines and I like how you captured the face! Thanks Kathie, I need a lot of practice really. You are not only a great photographer...You are a very talented Artist too!!!!!! Thanks Elvira, you are too kind.